Simply walking or driving around the Savannah area is a joy of its own. The beauty of the city’s architecture and lush oak trees, dripping with Spanish moss, are straight from a picture postcard. With a mix of historic architecture and modern cultural attractions, Savannah, Georgia, has developed its own distinct allure. This small city is touted as one of America’s prettiest towns, a fabulous romantic getaway, and a prominent center for the arts. Money Magazine has listed Savannah among the Top 100 Places to Retire, and Conde Nast Traveler Magazine has included Savannah among the Top Ten Cities in the USA. Whether traveling to Savannah for a visit or to relocate during retirement, this Southern city offers plenty of attractions to keep active adults entertained year round. There are historic sites, museums, shopping and dining centers, galleries and theaters, and much more. Simply walking or driving around the Savannah area is a joy of its own. The beauty of the city’s architecture and lush oak trees, dripping with Spanish moss, are straight from a picture postcard. Lovely antebellum homes were spared during General Sherman’s infamous March to the Sea, as the city was presented to Abraham Lincoln as a Christmas gift. Today, many of these homes have been converted into charming bed and breakfasts. For a taste of southern Savannah history, you can visit attractions such as Old Fort Jackson, The Andrew Low House, The Roundhouse Railroad Museum, or the Ralph Mark Gilbert Civil Rights Museum. And you don’t want to miss a trip to City Market. This historic district offers shopping, dining, art galleries, and live entertainment. When it comes to nightlife and entertainment, Savannah offers hot spots for every taste. Visitors can hear jazz and blues at intimate clubs, enjoy salsa or swing dancing, take in an outdoor concert, or explore one of city’s seasonal festivals. Live theatre includes performances at the Savannah Theatre, Lucas Theatre for the Arts, and the Savannah Civic Center. Nature lovers will also find several delightful Savannah attractions. Explore the regional beauty through the Savannah Area Council of Garden Clubs’ Botanical Gardens, or plan a visit to the Oatland Island Wildlife Center. Marine life is an important aspect of Savannah culture, and visitors can arrange a fun and educational trip to the The University of Georgia Marine Extension Service and Aquarium. If visiting Savannah inspires you to relocate to this beautiful area, there are lovely active adult communities within close proximity of the city. Within 30 minutes of Savannah, active adult communities include Westbrook Villas and The Fairways, both at Savannah Quarters in Pooler. Each of these communities are intimate neighborhoods with a range of amenities and social opportunities. 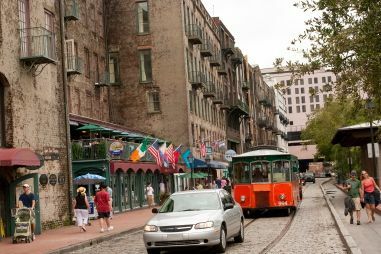 A trip to Savannah offers a beautiful sampling of Southern charm, historic style, and modern-day arts and entertainment. With sunny days and hot nights, Savannah is a perfect vacation getaway or picturesque retirement destination.